family, manhood, and the ocean. He is lured away from his mother (Roxanne Tapia), father, his hometown of rural Magdalena, by the material promise found in a colonial coastal city on his island in the Caribbean. While there, a carnival performer (Sabrina Garcia), playing the goddess of the ocean, Yemaya, tempts him with a taste of the eternal in sharp contrast with the city, which has "no memories." A natural disaster strikes Magdalena, then, the boy changes his name to Mulo and seeks to defy his narrative of loss in the city. He disregards council from his uncle (Jonathan Harrell), a coconut man who cares deeply for the boy (Argos MacCallum), and a city shopkeeper (Roxanne Tapia). Determined to avoid going back to Magdalena at all costs, he leaves all behind to cross the sea with a young woman, Maya (Sabrina Garcia), seeking the fabled luxury of the United States. Yemaya's Belly is at once a lyrical and stark portrait of a boy coping with grief by attempting to embody masculinity and by conflating that perceived manhood with mass-produced America - represented by anonymity, coca cola, and Spam. These stand in sharp contrast to the coconuts, dominoes, and close intimacy that represent the island. Perhaps most importantly, however, is the young pair's trek on a raft across the ocean. In this time, when thousands of people with no other recourse are risking their lives seeking asylum, it is imperative to recognize the circumstances and humanity of each. Mulo takes this distanced statistic and makes it deeply intimate and relevant. Yemaya's Belly, Hudes' first play, received the 2003 Clauder Competition for New England Playwriting, the Paula Vogel Award in Playwriting, and the Kennedy Center/ACTF Latina Playwriting Award and had productions at the Portland Stage Company (2005), the Signature Theatre (Arlington, Virginia (2005), and Miracle Theatre. In 2012, her play Water by the Spoonful, a second play in a trilogy which began with her play Eliot, a Soldier's Fugue (2006), won the Pulitzer Prize after its premiere at the Hartford Stage Company. 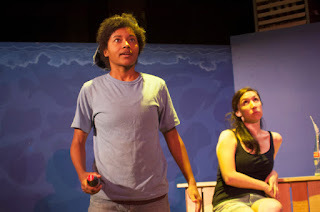 Teatro Paraguas produced Water by The Spoonful in 2014 under the direction of Fran Martone. Her latest play, The Happiest Song Plays Last, the third in the Eliot trilogy, opened at the Goodman Theater in Chicago on April 13, 2013, and Off-Broadway at Second Stage in March 2014. Performances of Yemaya’s Belly run for three weeks October 8-25, with performances on Thursday, Friday and Saturday at 7:30 pm and Sunday at 2:00 pm. Tickets are $15 general admission and $12 for those with limited income. Tickets for Thursday, October 8 are $10. Reservations may be made by calling 505-424-1601, or emailing Teatro Paraguas at teatroparaguas@gmail.com.